Joe Ansbro never imagined he'd approach a game of rugby with anything less than an all-consuming, unquestionable commitment. So when the prospect of a non-contact training session reduced him to a tangle of self-doubt and anxiety, he knew the ball was burst. Nine months on from the pre-season friendly - Ansbro's London Irish travelling to face Munster - and the characteristically fierce lunging tackle that broke his neck in the summer of 2012, his confidence had been shredded. "I was just terrified," says ex-centre Ansbro, looking back. "The edge that I'd had was gone. "I'd lost a lot of confidence, my movement patterns, vision and decision-making. "I was really dreading it. I felt supremely confident going into that season, in attack and defence, I was so looking forward to it. "Then it was almost like being in the academy again and getting your first training session. "I didn't get particularly close to coming back in the end - I didn't even get to controlled contact." Ultimately, Ansbro skipped the session. He announced his retirement soon after, aged 27. His was an unerring devotion that endeared him to his peers and coaches. He relished not just the practicalities of scything down opponents but the strategy and organisation that positioned him to do so. This would always, however, render him vulnerable to bodily grievance in the line of duty. The fractured vertebrae at the top of his spine consigned Ansbro to three months in a halo brace - a metal contraption attached via four screws to his skull that immobilised his neck. "I think that [the injury] was about the fourth time I tackled someone with my head in that game alone," he jokes. His Test career with Scotland was, by modern standards, fleeting, with 11 caps spread across two years. He was the first contemporary black player to represent the nation - not that he affords that statistic much more than a shrug - having been born in Glasgow and adopted at 10 weeks old by a white English family who lived in Dumfries. Erudite and articulate, he attended boarding school in Lancashire, and studied natural sciences at Cambridge University, featuring in varsity matches, and winning a contract with Northampton Saints. These days, he teaches biology at Harrow School - whose alumni include the meaty frames of Saracens forwards Billy Vunipola and Maro Itoje - and indulges in a spot of coaching, grateful to have left rugby with an able body under the circumstances. But there are moments, albeit growing briefer with the passage of time, where he longs for the banter and the camaraderie of the hours spent among the lads. "Ultimately, you become a fan again," he says of the transition. "There's a perception, particularly with the [Six Nations] Wooden Spoon, that Scotland are not as strong a rugby nation as they should be, and I hate that, because I know it's not true. "Glasgow don't win the Pro12 unless they've got a lot of good quality players. 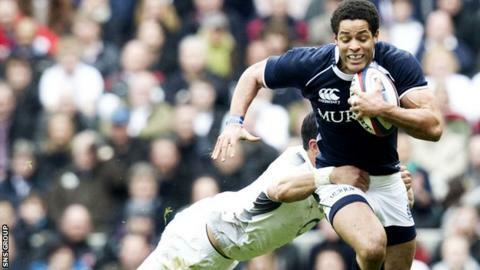 Edinburgh had a great run in the European Challenge Cup. "It's the same with coaching; you just want the boys to go out and show the world what they're about and how good they are. "We've always had very good players but our best players haven't always performed, which can be frustrating. "Now, everyone seems to be playing well, and it just allows you to build momentum." Ansbro knows what it's like to castle Australia, the maddening, rage-inducing finale to last Sunday's quarter-final loss in stark contrast to Scotland's 9-6 victory Down Under three years ago. Of course, that glorious triumph, in a New South Wales deluge, was immortalised online by the immediate aftermath, the Scots' flocking to form a delirious rain-soaked rammy, and Ansbro clashing foreheads with the somewhat beefier Al Strokosch, requiring nearly 50 stitches as a result. "It was probably the first time I'd ever celebrated, like properly celebrated, a win," he says. "It meant so much. "I'd been injured that Six Nations, we'd Wooden-Spooned it, and morale, after one lost game is bad, but you play four, five games of rugby, that pressure of letting so many people down, it can be pretty miserable. "All of a sudden to flip that round in one game was pretty ridiculous. "Without a shadow of a doubt, they underestimated what we were going to bring to the game. The weather certainly helped, kept the game nice and tight for us, and allowed us to strike in the last play." Ansbro played with plenty of Scotland's present roster. Alongside the treasured euphoria of sinking the Wallabies, and South Africa, he endured heartbreaks of his own. Failed Six Nations fixtures and an exasperating World Cup exit in 2011. But in Vern Cotter's side, he sees a spark, an unruly "fearlessness" and a familiarity fostered by domestic glory. "Having essentially an entire backline that plays at the same club, Glasgow, a successful club as well - these boys are used to winning," he said. "I'm so excited about the momentum the Australia game could help build - there's always hope, there's always optimism when you support Scotland, but I do feel like this is a step change. "I'm tired of people underestimating Scotland and Scottish rugby. Off the back of quite a few disappointing Six Nations campaigns, there's a lack of respect towards Scottish rugby that I think needs to be addressed. "I think people don't expect Scotland to win games at the moment, which is one of the great things about last Sunday, and also one of the bad things about last Sunday - everyone saw that we could have won the game, but we didn't. "I think it's time we set the record straight."